We’re already on the halfway mark through the big four international fashion weeks. With things getting pretty exciting in Milan over the next few days, we look back at New York and London fashion weeks and highlight three of our favourite runway trends for spring 2015. Yes, we know what you’re thinking. 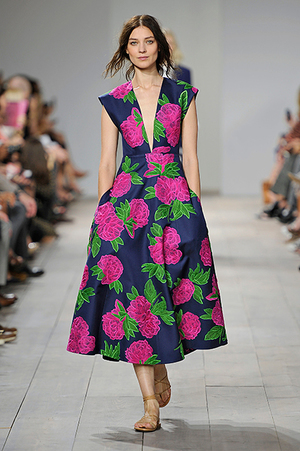 In the sarcasm-filled words of Miranda Priestly in The Devil Wears Prada: “Florals? For Spring? Groundbreaking”. But, we can assure you that, this time, it is different. Next season, the florals are bigger, bolder and better, adding texture to the whole look. In New York, Michael Kors gave the trend a wearable and fun spin while Thom Browne’s application of the floral motif added a touch of surrealism (by way of Alice in Wonderland) to his sharply tailored pieces. Over in London, luxury label Marchesa led the pack with exquisite floral threadwork trickling across silk tiered ruffles and billowing sleeves. Matthew Williamson, on the other hand, had gorgeous prints on flowing dresses, while Jonathan Saunders used simple petal designs, that are well-placed, for that touch of femininity to his origami-like, Japanese-inspired collection. Let’s face it: White is super chic but not many can work it. Especially when it’s an all-whte ensemble. But, when done properly, the colour white is such a bold statement to make. So much so that designers have gone, quite literally, clinical when sending out these looks down the runway. In New York, clean and simple white sheath dresses made an appearance on the Chado Ralph Rucci runway. The look is less Hamptons, more clinical nurse chic. Opening Ceremony also showed a fuss-free sheath dress in white that’s paired with platformed sandals. But if pure white ensembles scare you, take inspiration from London-based Turkish designer Erdem, who layered patterns of white leaves over sheer, slim-fitting dresses. The textured look gives the all-white ensemble a less intimidating vibe. Black and white stripes are always on trend. Wear different varieties all together for a dizzying look, or sparingly for a small injection of flair in a monochromatic get-up. At Thakoon in New York, the prison-stripe pattern was given a whimsical whirl as the designer, Thakoon Panichgul, added fringe details to the dresses. Fashion’s favourite designer du jour, Victoria Beckham, added bold monochrome stripes to her below-the-knee skirts, making the look very office-appropriate when paired with a sharp jacket. Over in London, the husband-and-wife team of Preen gave a cheeky spin to the motif by using stripes in red, blue, yellow against a black background.